People always talk about a glass being half full or half empty – and the way in which you choose to view the glass reflects your viewpoint on life. My take is this: no matter if people are “half full” or “half empty,” they’re all wrong. That glass is always full, because it has air in it. It’s full, just in a different way than you’re used to seeing. Where’s the air in your life that you’re not seeing? The truth is, there’s stuff all around us that we miss out on because we’re looking at something in one way; if we change our reference point or allow ourselves to back up, get up above our own egos, and attack a problem in a new way, the chances are good that you’ll find that “air.” You can’t leverage something if you’re not seeing it – by looking a problem with a new set of possible solutions, you’ve allowed yourself to make use of those solutions most effectively. Remember the glass is always full, so keep your chin up and find your own air. 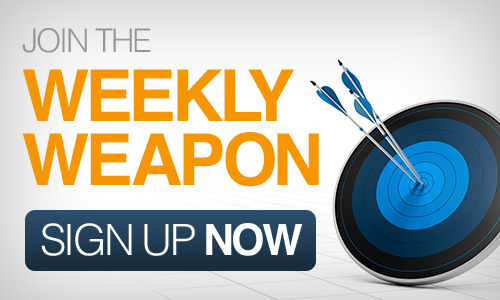 This entry was posted in Your Weekly Weapon With David Farbman on December 6, 2013 by David.